UPDATE 3: See my latest post on this here. Could you guys write just one more article about this exposé? Somehow 4 articles in a row just doesn’t seem like enough. thanks……. UPDATE: The only mainstream media outlet to even cover this non-story so far is The Guardian (natch). The others are the usual rancid Lefty/alarmist blogs, Puff Ho, StinkProgress, Climate Crocks, MeDog’sGlob – get the picture? Although you can bet that Fairfax and the ABC will lap it up if they get wind of it. 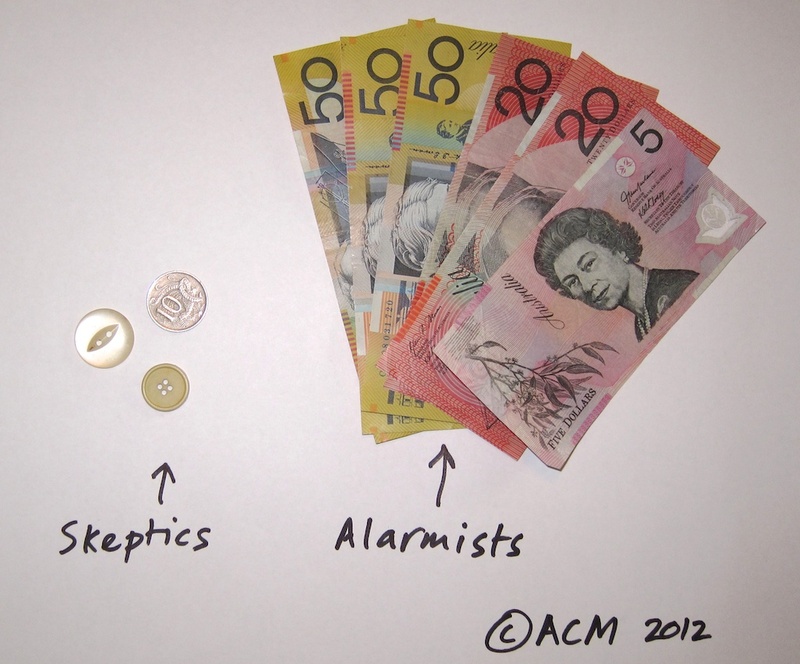 Hilarious to watch the ecotards wet themselves because some trivial documents have been released that show an organisation has not been funding alarmists! Shame on them. The deluded fools think this is some kind of equivalent to Climategate (v1 and v2), which demonstrated widespread scientific fraud, manipulation of data, destruction of emails and avoidance of FOI requests on the part of the consensus boys. The Cause has sucked up around $70 billion (that’s billion with a “b”) since the global warming gravy train set off about 20 years ago, but despite the obvious hypocrisy, the warm-mongers are outraged, outraged I tell you, that some “deniers” are getting, er, some small change. Un-Skeptical Pseudo-Science attempts to coin the phrase “Denialgate”… LOL. Ooh, you little tease! I can’t wait that long! Former Vice President Al Gore is launching a $300 million, bipartisan campaign to try to push climate change higher on the nation’s political agenda. Naturally, the hypocrisy of this is totally lost on their addled brains, and the headbangers’ totalitarian mindset dictates that only those who agree with them should be funded, even if it’s a ludicrously tiny amount as revealed here. Where’s my Big Oil cheque, that’s what I want to know. By the way, interesting background on MeDog’sGlob here. « If it's cold, it's "just weather"
One has to wonder what the motivation is behind reporting where funding comes from, for anyone. Whether someone’s statements can be determined to be true or false remains the same, regardless of whether they were paid billions, or nothing. Any reference to finance in this regard is purely ad-hominem. A different matter entirely is spending billions on useless propaganda, when it could be spent on solving real problems. And what does Tim Flannery receive as Chief Climate Commissioner? What do we get from him in return? Multiple failed predictions! Great value…NOT. They are beyond parody now. I can at least understand the vague conspiracy theory that dictates that the ‘fossil fuel lobby’ might have a motive to react against AGW alarmists but possible motivation would the tobacco lobby have?!?! Bob Carter is paid $1667 pm for science and Al Gore scores a total of over $400,000,000 for blatant lies ! Funny those warmists. They think the source of funding is more important than data and facts. I guess that is because they are incapable of evaluating data and facts. When my HuffPo piece came out questioning Gore in 2009 DeSmogBlog was part of the radical Left apparatus used to ad-hom me into smithereens. But, like the Terminator, I have reassembled. Anyone in posession of those documents are in posession of stolen items. Releasing the information on those documents will encourage litigation. I hope Desmogblog has deep pockets. So, do they have proof of data tampering?